On Wednesday, I got a ride home by a colleague (travel time of 10 minutes instead of ±55…). He gave me a ride home before. This time he brought his other car. So I mentioned the commute to and from Facebook by public transport. I used to take the bus1. It averages 55 minutes (doorstep to doorstep, so including walking). Ever since moving in to my suite, now two weeks ago, I’d been taking the bus. That’s about 2 hours per day. Gone. I hate wasting time. I hate it when a site takes 200 milliseconds longer to load than it should. Needless to say, I really hated this massive waste of time. So, I was absolutely sick of it. And I was planning on getting a bike for weeks now, but if you leave the office between 20:00—21:00, it’s impossible to still go and get a bike. So, on Friday I left at 19:00 and set out to get a bike. At last! 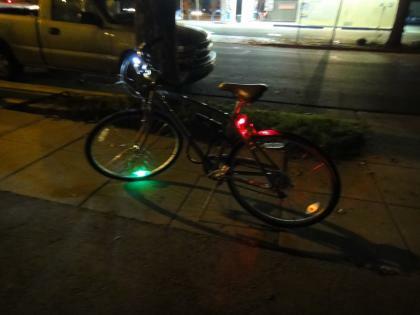 Since I most definitely want to return to my girlfriend in Belgium in one piece, I added not only the standard lights on the front and back, but also a green light in my front wheel and an orange light in my back wheel. So that cars would see me driving, because they haven’t heard of proper bike lanes or street lighting around here (the U.S. are very car-centric). 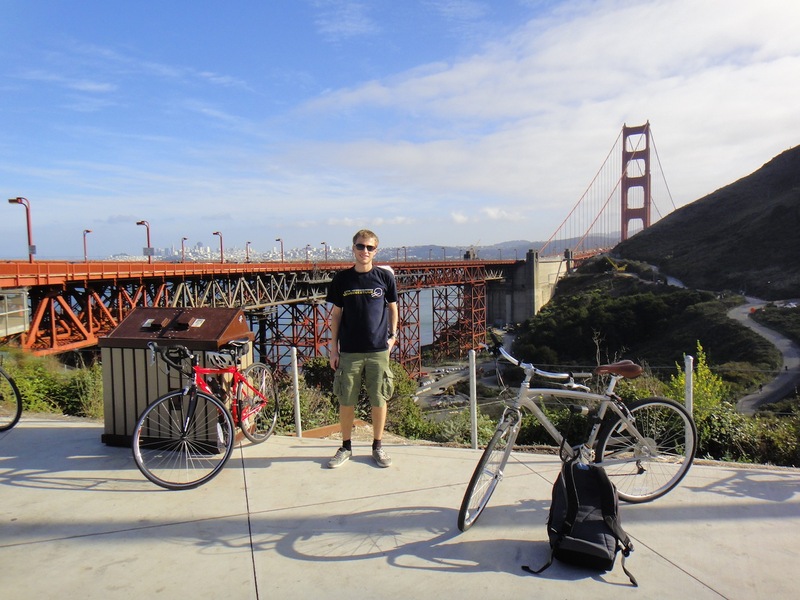 On Sunday, I visited San Francisco by bike. If there’s one thing that works well in California’s public transport system, it’s taking your bike on the train. There’s a bike carriage that always stops in the same spot, bikes with the same destination are stored in the same stack, there are no stairs to mount or descend with your bike. Great experience. 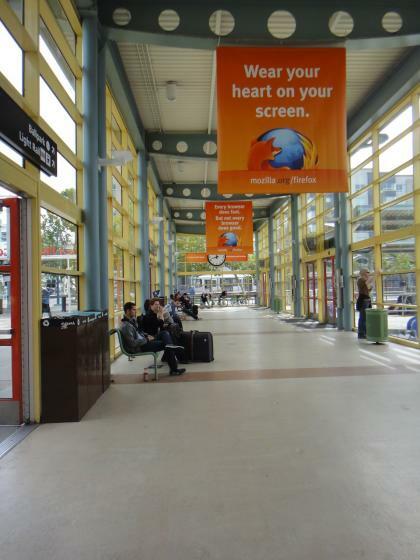 Arriving at the Mountain View Caltrain station, I noticed there was a farmer’s market going on — very similar to Belgian markets. Except that there was even music performance going on in this one, country music from what I can tell. It’s very reminiscent of Firefly’s soundtrack. From the SF Caltrain station (4th & King street) — where there were Firefox banners by the way, I biked in what seemed to be the least densily built area. From there, I biked along the many piers in San Francisco, had the Legendary Burger (10 oz or a whopping 283.5 grams) for lunch2 at the Hard Rock Café in Pier 39. While eating this massive burger, there were the jolly jingles of the American Roots music by Dave Earl3. Ik blijf echt gefacineerd door jouw fiets Wim !!! !